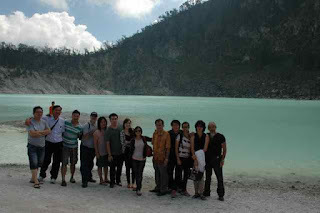 I've been overseas for a short trip to attend a friend's wedding in Indonesia. Been back a few days and needed to get the house in order. I'm having withdrawal symptoms from card making! Needed to do a quick one for my niece's 21st next month. She went to Paris last year and I wanted to use the Eiffel Tower paper from MME Lost and Found. 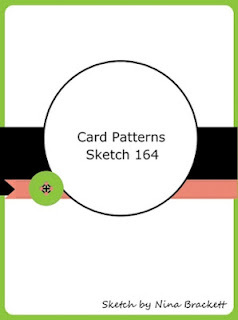 I decided to use the current Retro sketch challenge and combined it with the Moxie Fab World Gingham Card Challenge. 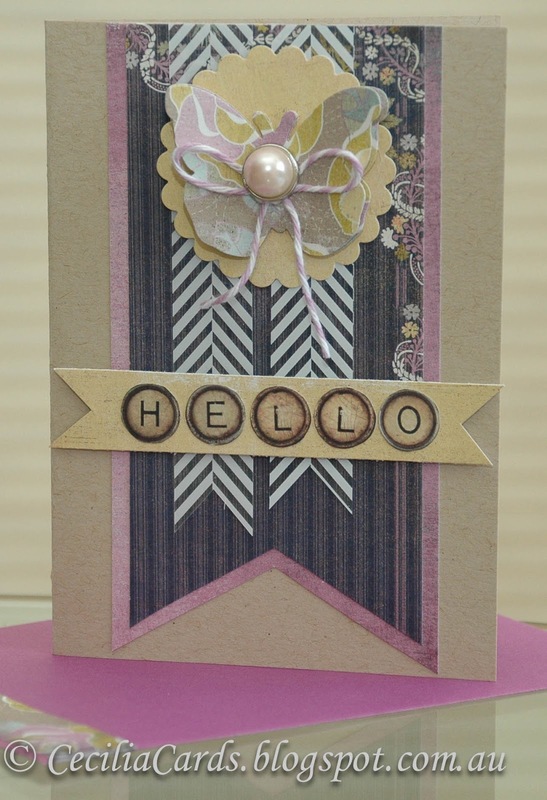 Needless to say, the colours of the card was based on the pink/brown gingham I had in my stash, there was just enough for this card! 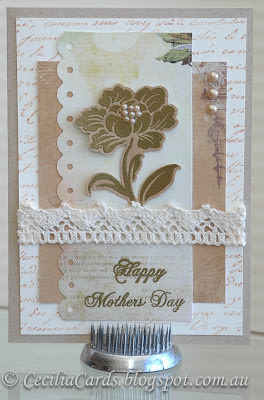 Since I used Hero Arts stamps and mid-tone inks in this card, I'm also entering this into HA May challenge. 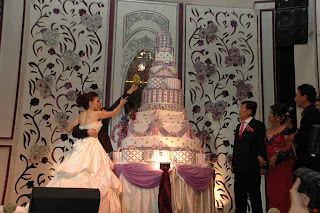 Scroll down below for all the details of the card and I have some photos to share from the wedding in Jakarta. 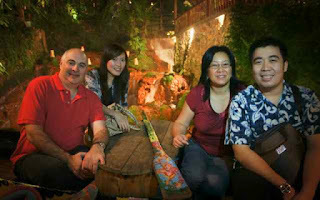 Photo taken at a jungle restaurant in Bandung, taken with no flash. We used our iPhones to light up our faces! I was so excited to get a Flickr mail from Chris Millar a few weeks ago asking for permission to show two of my cards on Aussie Scrap Source. Please find the link here. 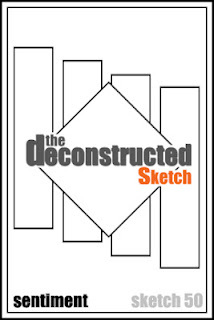 Pop over and have a look. 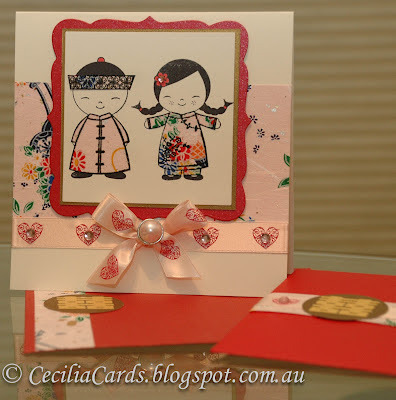 Both my cards have been previously featured on my blog: - Butterfly HA sketch - 3 Butterflies I'm posting this blog as we enjoy our nice long weekend in Jakarta. This is my first trip to Indonesia, really enjoying the hospitality here and looking forward to attending my friend's wedding tonight with over 800 guests tonight!! Will post some photos when I get back! Thanks for dropping by! Back again after making two wedding cards. We are going to a Chinese wedding in Jakarta next week and I wanted to use my Chinese dolls again. 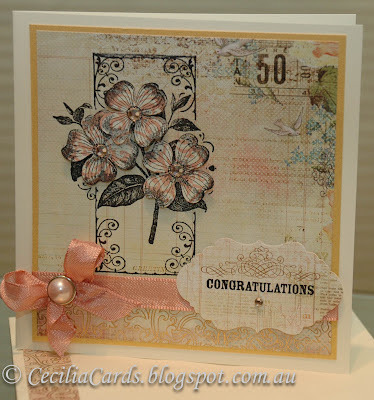 These stamps were the first Hero Arts stamps I purchased last year when I was inspired to start stamping again. 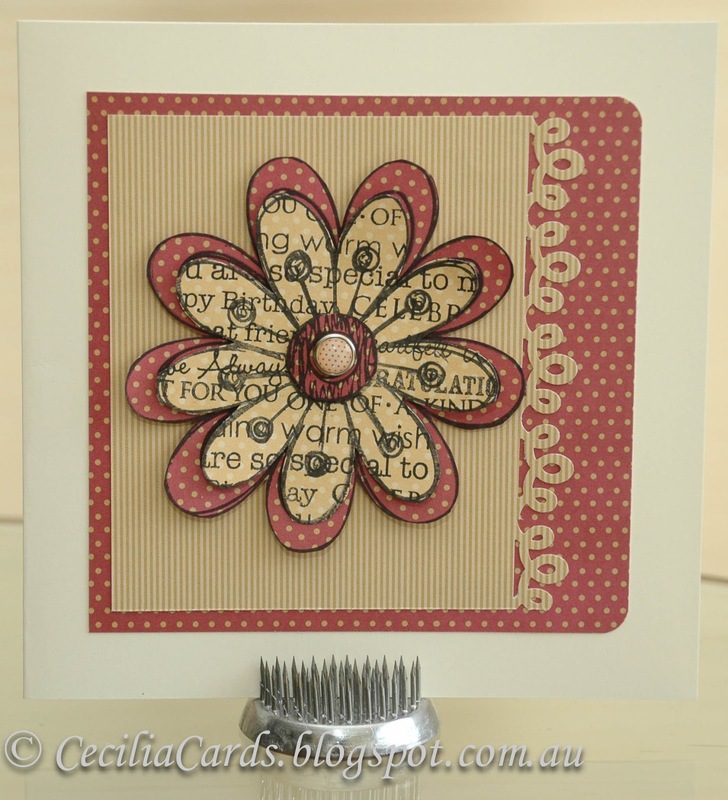 The Blog Named Hero's challenge is to 'Dust the old stamps', so most appropriate for this card. I also needed to make a 'Red Packet' as well for this wedding as it is traditional to give money for a Chinese wedding instead of buying a gift. 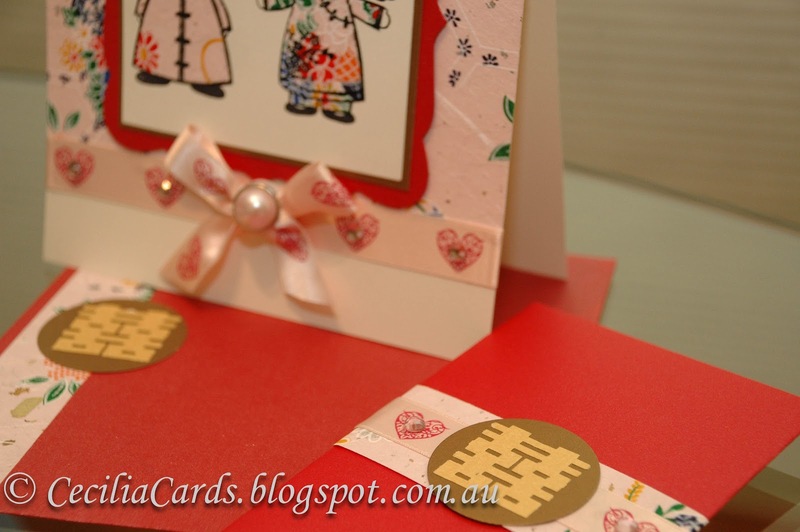 I made the envelope and red packet all tie in with the card I made. 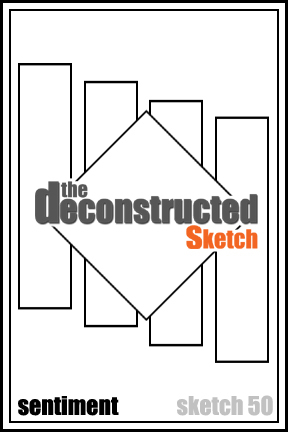 The card is below with the process of making it below that. 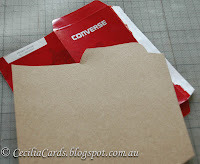 I started off with taking apart a red packet and drew a template on card - this way, I can use the same template again. The template was outlined on red metallic paper (card stock would be too thick) and folded and glued on two sides. I then added matching washi paper, ribbon and the Chinese character for 'Double Happiness' to both the envelope and the red packet. I also added this to inside the card as well. I hope my friends like it! Looking forward to a grand wedding next weekend!! The second card is for our bank teller who is getting married next week. 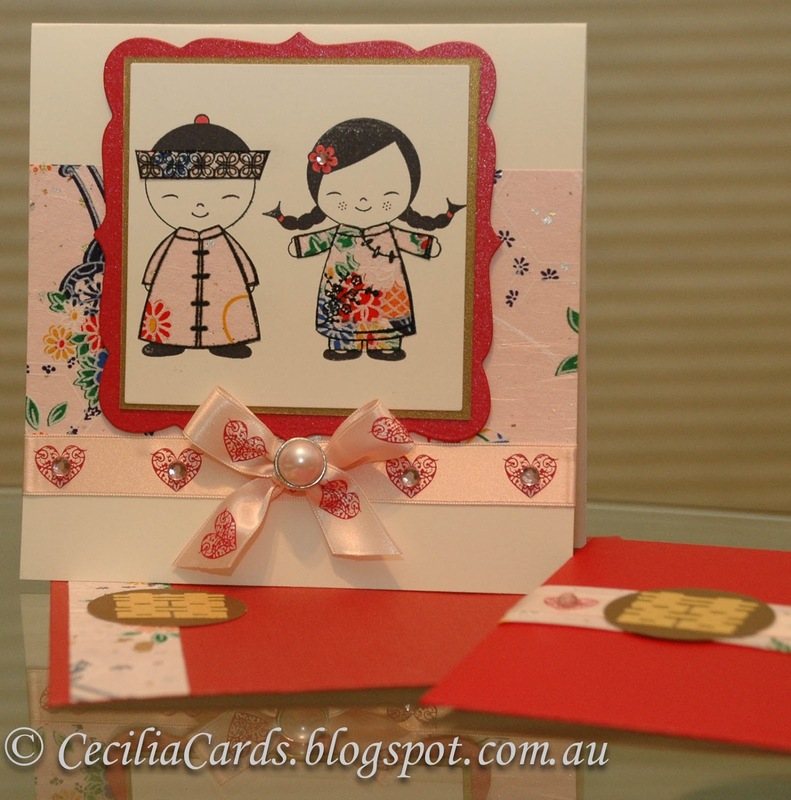 She is not Chinese, so this is a totally different card to the one above! 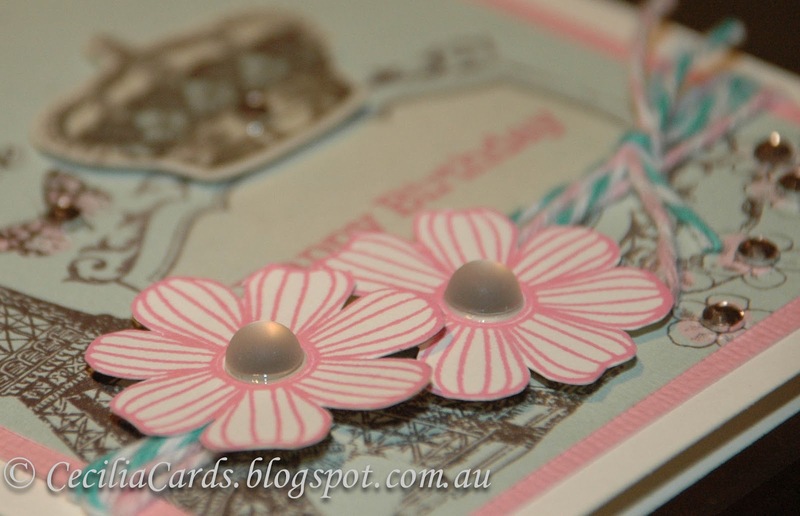 I wanted to use the beautiful paper from the Kaisercraft Sweet Nothings pad as this have beautiful soft colours I could use. I also used my favourite dogwood stamp for a bit of fun paper piecing - my favourite technique. I used a strip of patterned paper on the envelope to match. Thanks for dropping by! I'll be off air until I get back the following week! Been busy this week, a little bit behind with a few things I have to do before we go away next weekend for a wedding in Jakarta. I participated in the Spring card swap in the Flickr Hero Art group. I send my card to Marcy and I receive a card from Arlene. It's a little bit daunting as there are some brilliant card makers in the group, so I had to make a really nice card to send. I have been admiring Joy Taylor's Basic Grey card and decided to participate in BG's challenge to case it. 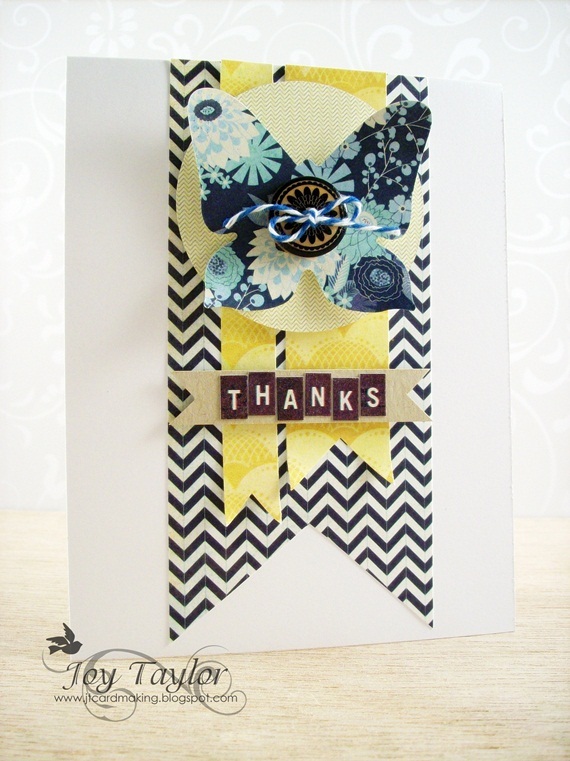 The card was made with no stamping using BG patterned papers. 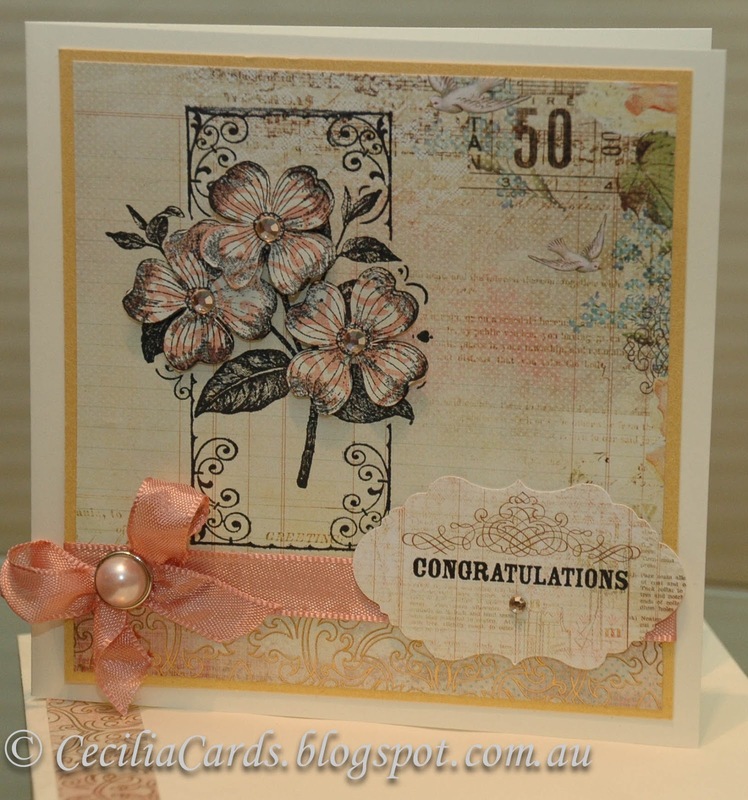 I rummaged through my BG 6x6 cards and picked the Plumeria papers as I have not used them yet. 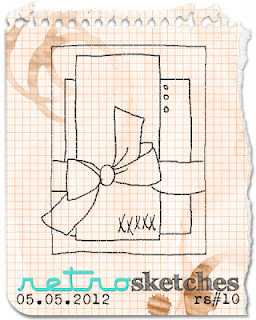 I also added some a strip of patterned paper to the envelope. Here is my card and Joy's card is below. I've decided to change the way I post my photos as I am now using LinkWithin and it shows the first photo in a post. 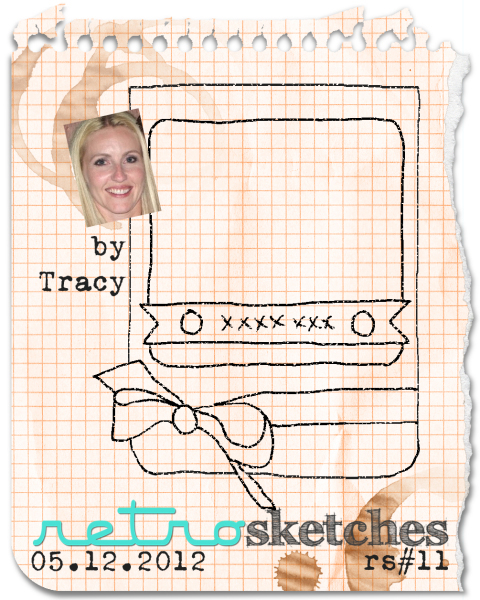 This card is destined for Marcy in USA, hope she likes it! Have a great weekend! I often participate in the Hero Arts Flickr group 90 minute scramble. 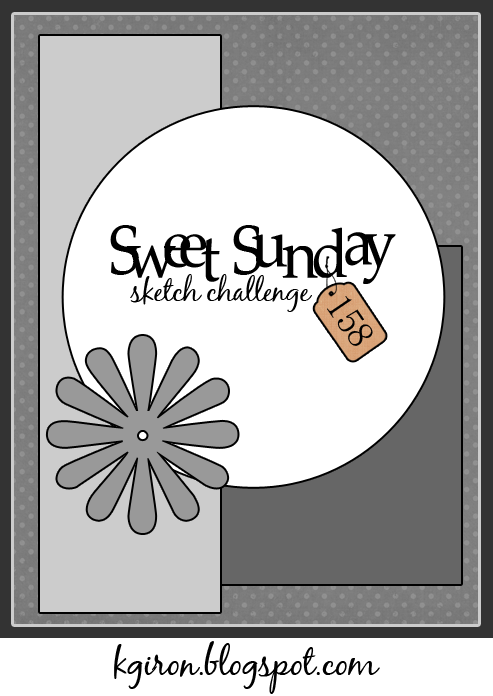 The task is to make a card within 90 minutes and the theme is set at the start of the scramble. Sometimes the timing is not exactly ideal as most of them are set at American times. 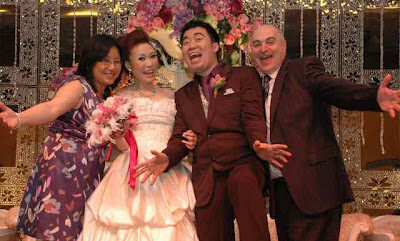 There was one last Saturday night at 8pm NY time which translated to 6am Melbourne time (on Mother's Day). I got up for it and made the card in under 60 minutes as we had a house guest getting ready to head off at the airport at the same time. I just made it just in the nick of time. 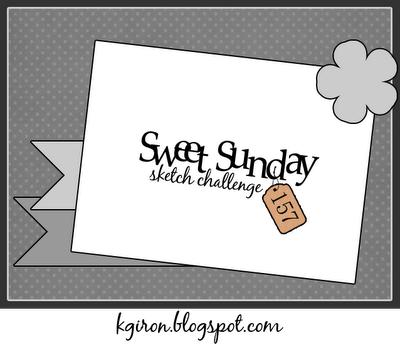 I decided to use the current retro sketch for the challenge. The scramble challenge was set by the lovely Cheiron and the task was to make a card for ourselves rather than anyone else. 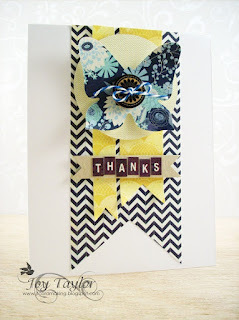 I chose my new MME Chevron washi tape and used a matching Chevron paper. The contrasting colour was a dark pink. I used my favourite papers from My Minds Eye. 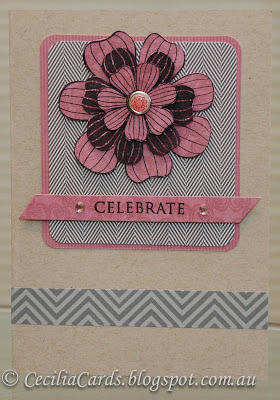 The flower was stamped on patterned papers and fussy cut and layered with foam dots, finished off with a brad from Kaisercraft. 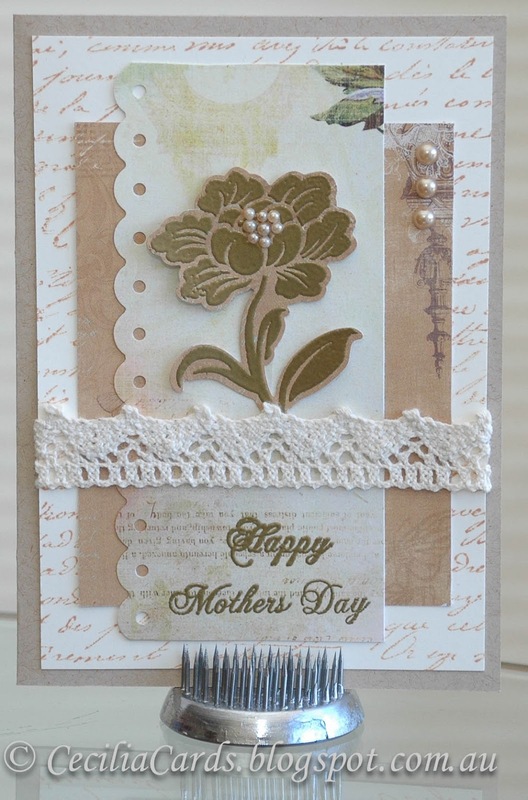 A card to 'Celebrate' Mother's Day for me!! Thanks for dropping by! Happy Mother's Day to all the Mums out there. 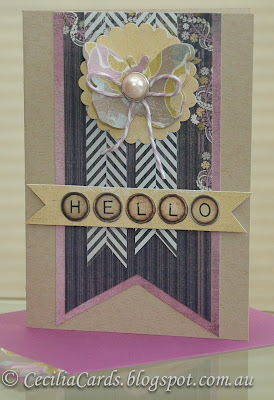 Another quick card for me to submit to A Blog Named Hero Topsy Turvy challenge before it closes in a few hours time. 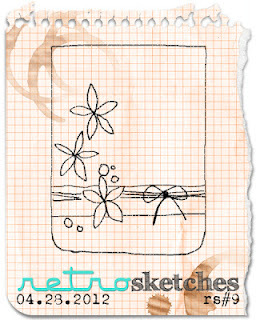 I overstamped a series of sentiments on the HA Magical Flower. 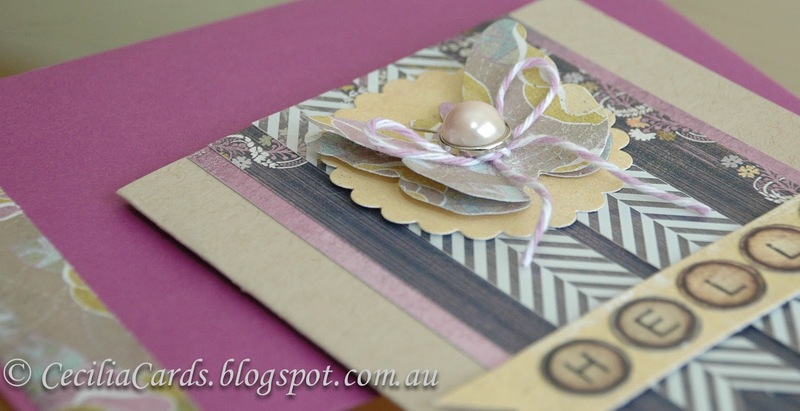 This card suits a square card (15x15cm) and goes beautifully with my favourite papers from My Minds Eye. Have a great day to all the Mums today! 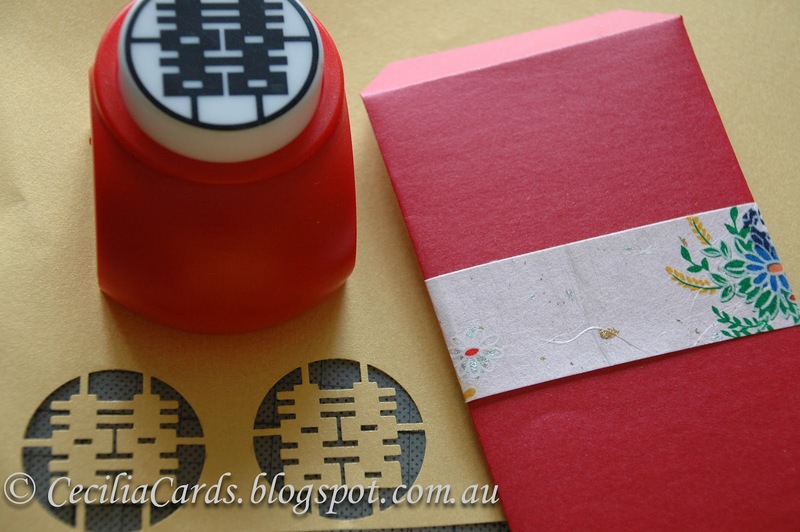 I received my little parcel of goodies from 2Peas in a Bucket this week, and I could not wait to play with some of the new stamps I purchased. Everything except one item was discounted, I can never resist a bargain! The sketch I based the card on was the following Sweet Sunday Sketch 158. 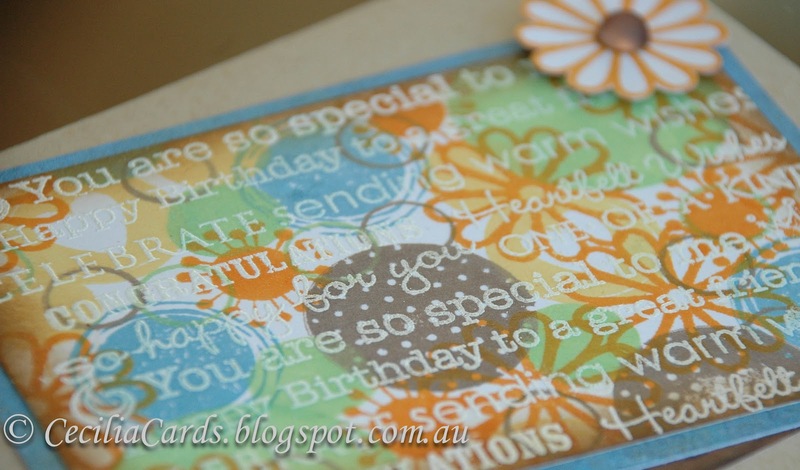 I wanted to keep the card simple and decided to use three lovely patterned papers from Fancy Pants Summer's End and the Hero Arts Birthday Frames to create a quick and cute birthday card. I like this so much, I may make a series of these (when I have time) with different bright colours! I'm going to also submit this card to the Hero Arts Birthday challenge. Thanks for dropping by! More wonderful inspirations from Runway Inspired Challenge with a beautiful dress from Christian Dior's Fall 2012 collection. 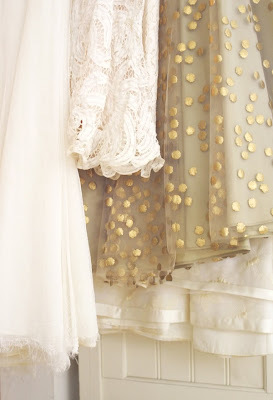 I love neutral colours! I used the Card Patterns Sketch 164 to create my Dior card. I decided to use Basic Grey/Hero Arts Sweet Threads stamps for the background to mimic the colours on the dress. The sentiment from Technique Tuesday together with the buckle (which has been in my stash for years) tied it all in very nicely. I was pleased with the end result. Thank you for dropping by! Back again with another card. 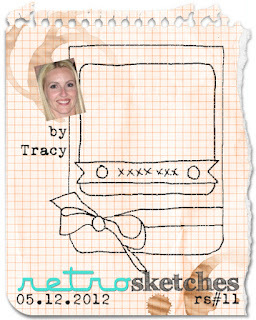 I needed one more Mother's Day card for this weekend and decided to use Moxie Fab's Tuesday Trigger and the current Retro Sketch #10 to make this card. 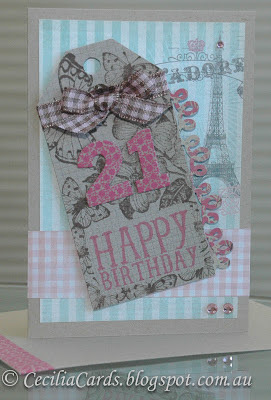 I used the patterned papers from Kaisercraft Sweet Nothings to construct this card. 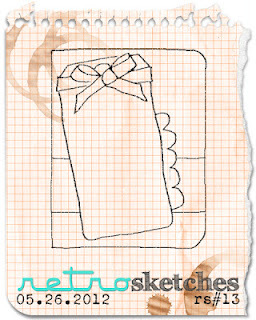 I had originally bought a wide organza ribbon with gold dots and could not get it to fit in nicely with this sketch. 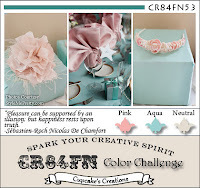 So I decided to use a bit of lace to go with the vintage theme instead. 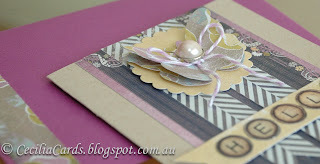 A bit of gold embossing and pearls finished off the card nicely. Thanks for dropping by! I have two nieces turning 12 this year, one of them next week. I thought I better get two cards done at the same time. It's time to take out my Washi tapes and have a play again. I am entering these cards into two new challenges for me anyway. 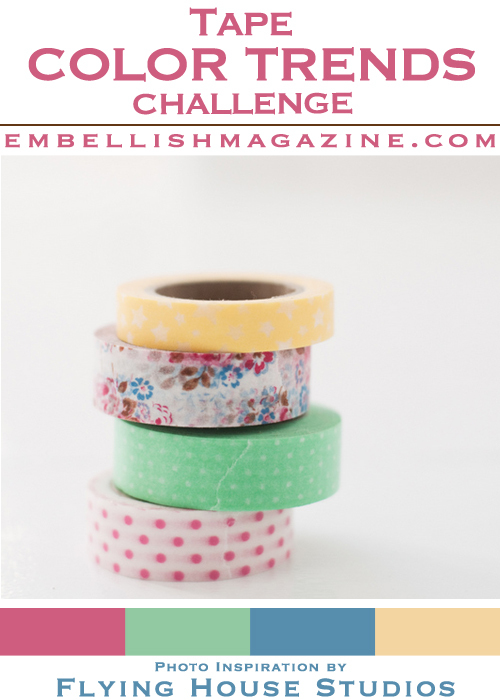 The Deconstructed Sketch 50 caught my attention as perfect for the Embellish Washi tape challenge. What a great combination! I also added them to the Simon Says Stamp Happy Birthday challenge. 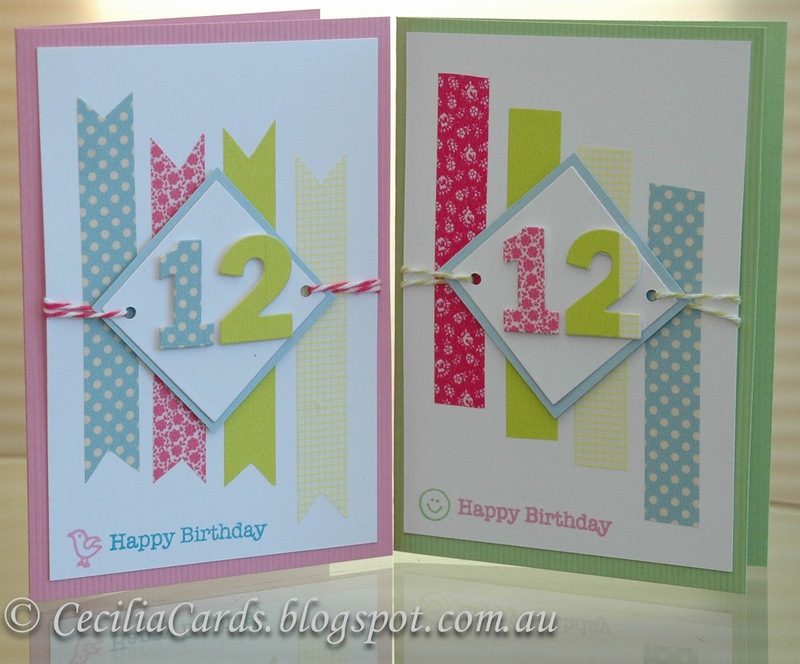 I used the My Favourite Things numbers die for the first time to cut out the numbers 1 and 2 from washi tape on cardstock, the rest was pretty easy. 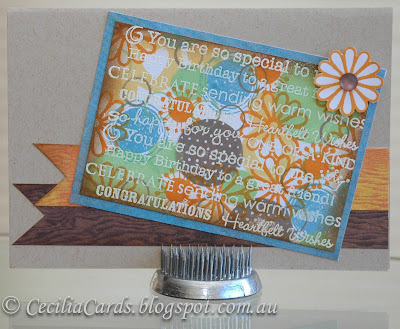 This was such an easy card to make and I made two in no time! My Mum dropped by yesterday and was saying she needed to buy a birthday card for my niece.... so I gave her one of these cards... now I need to make another one today with a different design. 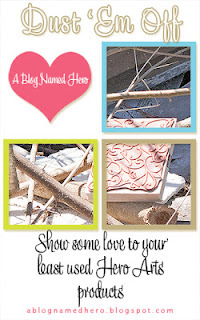 What a great excuse to go back my Craft room! Thanks for dropping by! Back again with another card using the Sweet Sunday Sketch 157 and the colours of the Hero Arts May challenge - Pool, Green, Yellow, Orange and Chocolate. 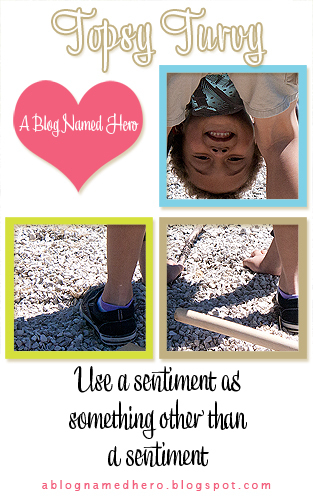 I also wanted to try using sentiments as a background for the current Topsy Turvy challenge for A Blog Named Hero. 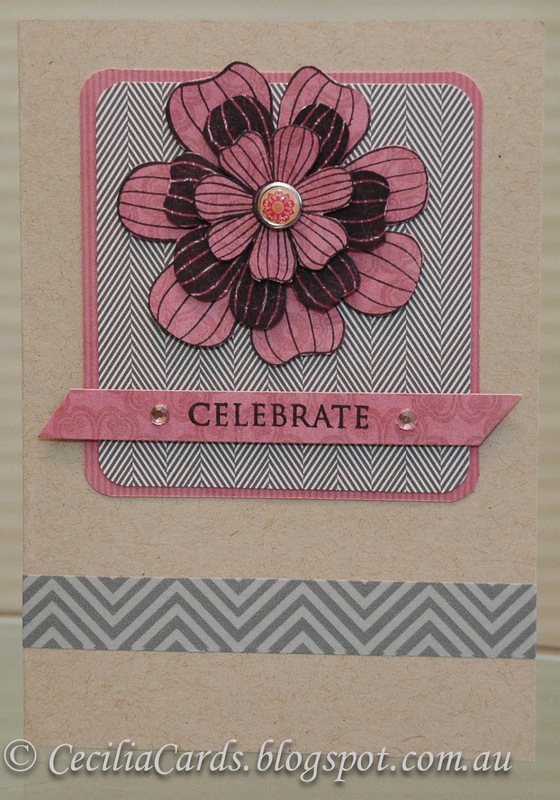 I kept the background plain as I wanted the main stamping to be the hero of the card. 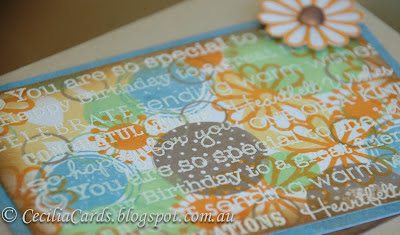 I white embossed a series of sentiments and then overstamped with all the colours of the the HA May challenge. I initially tried to do velveteen stamping, but the effect was not as good. At the end I was quite happy with the result! It is so good to challenge myself and go out of my comfort zone!! It's my Mum's 77th birthday tomorrow. 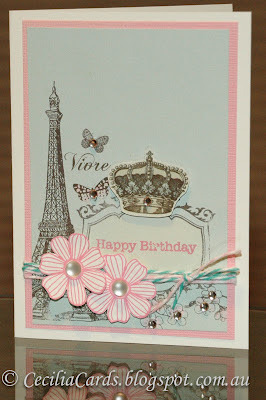 I've made a card for her with a Paris theme as she is going to Europe later this month. 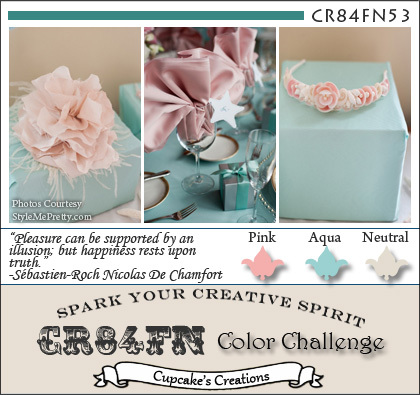 I've decided to use the colours of the CR84FN53 challenge (Pink, Aqua and Neutral) and the Retro#9 sketch. 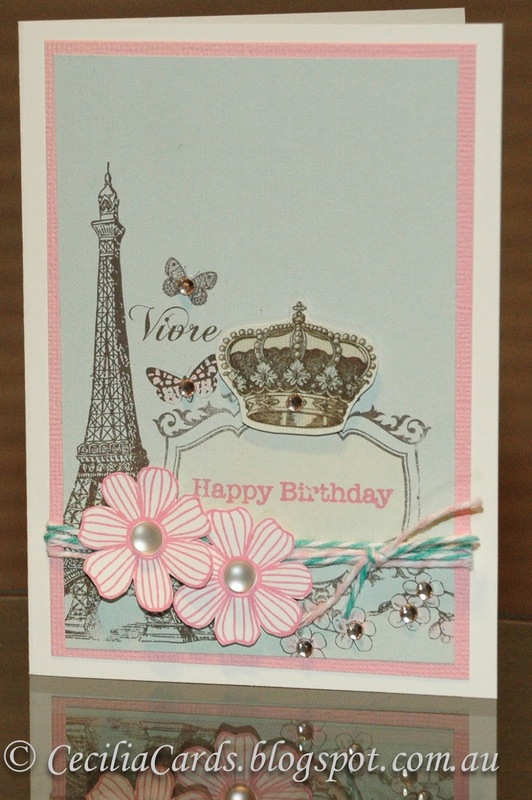 The Kaisercraft Bonjour collection have a lot of beautiful colours and I spent last night cutting out butterflies, flowers and a crown which suited the layout of the card. Here is my card using two HA flowers and sentiment stamped in Bubblegum, and a crown from the KC Bonjour collection. The three elements were mounted on dimensional foam. 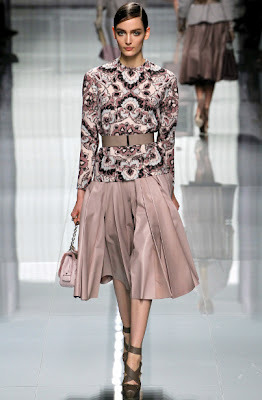 Yes, I would love to go to Paris one day!! We are taking Mum to the Opera for her birthday to see Turandot, her Italian lessons will come in handy as the opera is all in Italian!! Thanks for dropping by!